In most of the countries from Central, East and Southeast Europe (CESEE), the current virtuous circle of rising consumption and incomes is expected to continue at least in the near term, accompanied by solid GDP growth to the tune of some 3% p.a. 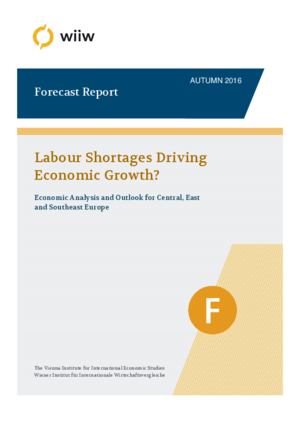 Ongoing labour-market improvements and rising wages will continue to be the main growth driver throughout the region; they will be complemented by a recovery in fixed investments as new EU funds become available. The economies of Russia, other CIS countries (except Belarus) and the Ukraine are expected to bottom out, as the negative shocks of the past two years have already been largely absorbed. Turkey is heading for a ‘soft landing’. These are the main findings of the newly released medium-term macroeconomic forecast by the Vienna Institute for International Economic Studies (wiiw). Despite the sluggish external environment, economic growth remains fairly strong in the majority of CESEE countries; the economic dynamics in almost half of those countries have intensified over the current year compared to 2015. Growth in the EU Member States from Central and Eastern Europe (EU-CEE) has declined only modestly over the current year, mostly on account of temporary investment weaknesses. It remains 1.5 pp higher on average than in the euro area. In Turkey, economic dynamics were also very solid up until mid-2016, albeit accompanied by signs of ‘overheating’, while the CIS countries are experiencing a ‘bottoming out’. The main driver of growth throughout the CESEE region continues to be private consumption, underpinned by sharply rising wages and incomes as well as decreasing unemployment. The tightening of labour markets and the rising labour shortages are partly a consequence of sizeable outward migration over the past years, which has had a cumulative negative effect on labour supply. A number of countries have also introduced higher minimum wages, sometimes as part of a more general fiscal relaxation package. Inflationary pressures in most CESEE countries – with the exception of the CIS countries and Turkey – are almost non-existent, as solid wage growth has been largely offset by marked gains in labour productivity and a profit squeeze. The expansion of fixed investments, which were an important pillar of GDP growth in 2015, has largely run out of steam this year. In the EU-CEE region, the main reason for this lies in a temporary drop in EU transfers that, in previous years, used to be an important source of investments. EU funds disbursed under the previous 2007-2013 Multiannual Financial Framework (MFF) were absorbed in 2015 at the latest, whereas attracting new funds under the recently adopted 2014-2020 MFF will take time. At the same time, disregarding the ‘EU transfers effect’, the underlying dynamics of investments remain strong. The export dynamics in many CESEE countries have been better than those of imports, resulting in a positive contribution of net exports to GDP growth. In most EU-CEE countries and Serbia, this is largely a reflection of their ever-strengthening export base and further gains in competitiveness. However, in the CIS countries it is entirely due to the weakness of domestic demand which is still depressed following strong currency depreciations over the past two years. Credit expansion in the CESEE region remains rather modest: no country, with the possible exception of Slovakia, is currently experiencing a credit boom. Other factors tend to be more important determinants of the demand for loans than interest rates, which in many CESEE countries are rather low. Going forward, this reduces the risk of ‘boom-and-bust’ developments that have characterised the trajectories of a number of CESEE countries in the run-up to and during the global financial crisis. Domestic demand in many CESEE economies is supported by fiscal policy relaxation, particularly in Romania and Ukraine. One reason for this may have been a decline in government borrowing costs. Furthermore, the general disenchantment with the practical results of ‘expansionary austerity’ pursued in the past has played a role as well. At the same time, in most Western Balkan countries and in the CIS, the fiscal stance tends to be either neutral or restrictive – and in the case of the CIS countries it is essentially pro-cyclical. The impact of the forthcoming Brexit on CESEE economies should be contained by those countries’ relatively low trade exposure to the UK economy. In the EU-CEE region, some 1.6% of GDP is accounted for by final demand from the UK, and that share is even lower in other CESEE countries. At the same time, from 2019 onwards the EU-CEE region potentially faces the prospects of much lower (by up to 20%) EU transfers once the UK – the second largest net contributor country to the EU budget after Germany – leaves the bloc. The migration flows from the EU-CEE region to the UK could fall by nearly half compared to the past two years even without any changes to the migration regime, as the UK will become less of a magnet for migrants.